Fashion is known for being notoriously white. In an industry where a lack of diversity is all too normal, these two black designers are completely redefining luxury fashion on their own terms, one collection and one collab at a time. Virgil Abloh is one of the hottest people to watch in fashion right now, but to simply call him a designer would be an understatement. A person of many talents, when the Ghanaian-American renaissance man isn’t putting together flawless outfits, he’s blessing the masses with his styling and DJ skills. However, he had to work hard for his fame, studying some of the biggest names in the business. For instance, Abloh’s true moment in the spotlight began when he became Kanye West’s key creative consultant. He became known for his help with merch, album covers, and other design elements for Yeezy himself, which, to quote Kanye, is “kinda like a big deal.” He then used this experience to start the (now famous) high-end street style brand Off-White in 2013. Fast forward to today, and Abloh has now debuted his first collection as artistic director for menswear at Louis Vuitton. The show gained a lot of praise and attention, especially because Abloh is Louis Vuitton’s first black artistic director and one of the only black artistic directors in luxury fashion… yup, in 2018. Abloh was also just featured on the cover of Business of Fashion’s 500 Special Print Edition, in which he was dubbed the “disruptor.” In the article Abloh says “.... I’m not a designer; that term seems like it’s for traditionalists… TBD the new title.” This rebellious spirit, in addition to his lack of formal training and unconventional style, has drawn lots of flack from industry professionals, many of whom claim that Abloh just puts logos on things. But despite their criticisms, Abloh has proven that his new take on luxury fashion is here to stay. Abloh’s most recent collaboration with Nike was another example of his defiant spirit. Upon hearing that he had been tasked with designing Serena Williams’ outfit for the US Open, he made sure that the final look strayed far from tradition, including a black leotard and tutu-like skirt for Serena. However, when he's not making moves in the fashion industry, he’s breaking barriers somewhere else: DJing for Travis Scott, signing sneakers, collabing with Ikea, and hanging out with his super cool rapper friends we can only dream about. So although he’s not one to play it safe, we think it’s safe to say that from sweatshirts to suitcases, everything Virgil Abloh puts his “LOGO” on turns to gold. 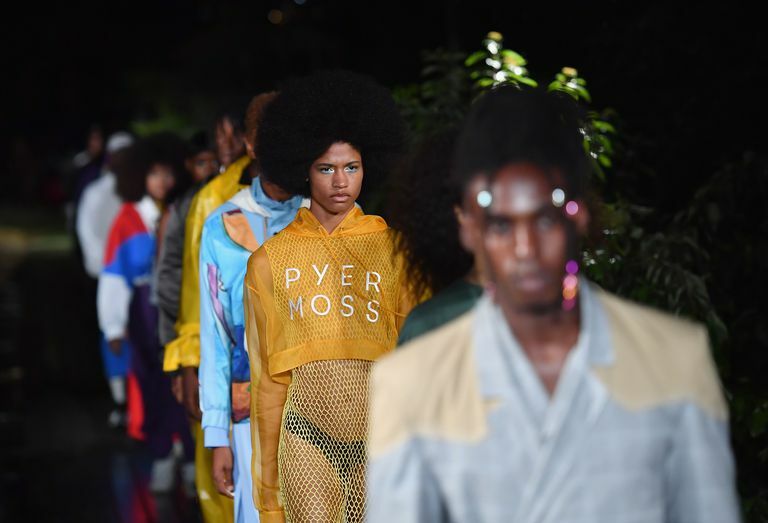 Another black designer on the scene is women’s and menswear label, Pyer Moss. Founded in 2013 by Kerby Jean-Raymond, the label is “... concerned with building a narrative that speaks about heritage and activism.” The label is unique in that it puts activism at the center of its designs, highlighting a lot of the things many other fashion companies would like you to forget. For instance, their 2016 menswear collection used video and street art to highlight police brutality throughout the show. Additionally, rather than hiring a stylist from his team, Raymond had African-American R&B singer Erykah Badu style the entire AW16 line. His most recent show at New York Fashion Week also received rave reviews and was all over social media for its bold creative choices. The show took place in Weeksville, Brooklyn, one of America's first free black communities, and featured an all black gospel choir to really shine a light on some of the groups that are often overlooked by luxury fashion lines. The collection was shown by all black models and featured messages like “Stop calling 911 on the culture,” on the clothing. These men are just two of many up-and-coming black designers that are gaining much deserved attention in the industry, proving that fashion absolutely has room for diversity and the results can be amazing. There’s room for growth, there’s room for change, and there’s room for every black designer who’s been told there’s no more space for them. Plus, who doesn’t love a dope graphic tee? !